LXI, 199 p., 18,3 x 25,5 cm. 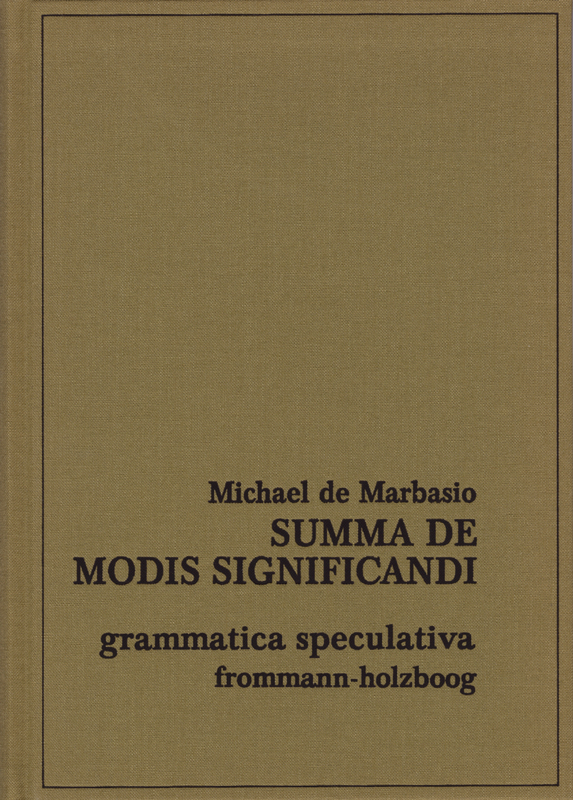 Michel de Marbais, a Paris Master who probably belonged to the circle of Boethius Dacus, designed his ›Summa de modis significandi‹ as an introduction to ›grammatica speculativa‹. It seems to have been in common use from about 1270 to 1330 and again during the revival of the via antiqua during the fifteenth century. Michel is also credited with a ›Tractatus super grammaticam‹ and some ›Quaestiones super Priscianum minorem‹. The basic model used by Michel is still fully operative in the generation of Thomas of Erfurt, although by then the terminology had become more abstract. Though Michel’s use of concepts from the philosophers and theologians is perfectly orthodox, his insistence on consistency leads him into innovation. Kelly has served the scholarly world well by his excellent edition of a treatise that demonstrates once more the sensibility of the Modists for the deep structure of linguistic tools. La qualité remarquable de l’édition que nous présente ici L. G. Kelly offre à l’amateur de telles spéculations un morceau de choix.